Discussion in 'International Relations' started by Zeus_@21, Oct 9, 2014. Islamabad may not be awed, but it certainly is shocked by the ferocity and volume of the Indian response to ceasefire violations along the International Border in Jammu and Kashmir. Given complete freedom to act by the government, the Indian Army and Border Security Force are firing back at will from every spot the Pakistanis have targeted. The volume and intensity of India’s return fire is much higher than the usual calibrated response the Pakistanis have come to expect. 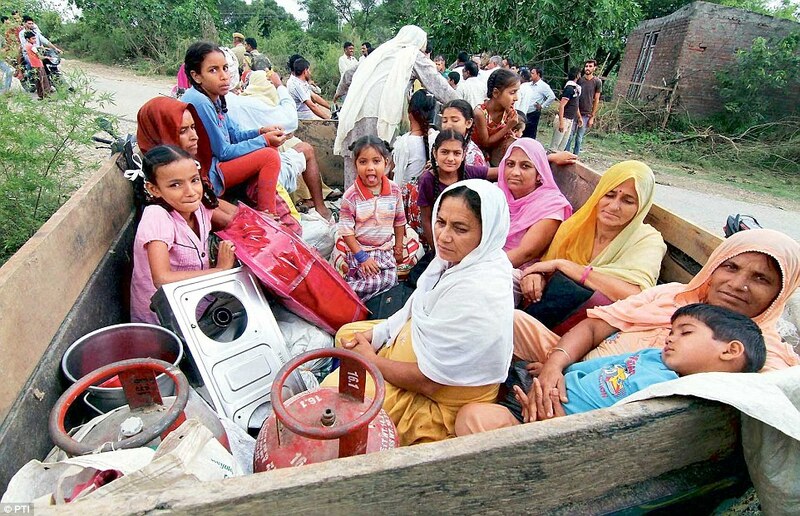 Residents of the Chilayari village in Samba district sit in a trailer as they prepare to leave the area following the death of two women who lived here. Top government sources told Mail Today that Indian forces are systematically targeting infrastructure and force deployment nodes on the other side. The damage on the other side is so high that Pakistan is, according to an internal report sent to South Block by the Indian mission in Islamabad, “ducking for cover”. A media blackout of sorts is in place in Pakistan’s affected areas, so as to keep a lid on the extent of damage suffered. Pakistan’s military establishment is on the verge of losing face, and it doesn’t like the evolving situation one bit. Prime Minister Narendra Modi was the picture of confidence on Thursday evening during a function at Air Chief Arup Raha’s residence. “Everything will be all right soon,” he said. The government is understood to have also told Indian forces not to seek any flag meeting with the other side, thus sending the signal that it is in no mood to ease situation on the border with Pakistan until the ceasefire violations come to a complete halt. Top government sources said that firing on the International Border was a result of Islamabad’s frustration over New Delhi blocking all of its attempts to internationalise the Kashmir issue. Channels shut India’s massive retaliation to the ceasefire violations has resulted in at least 35 deaths across the border, as per an assessment based on open sources. 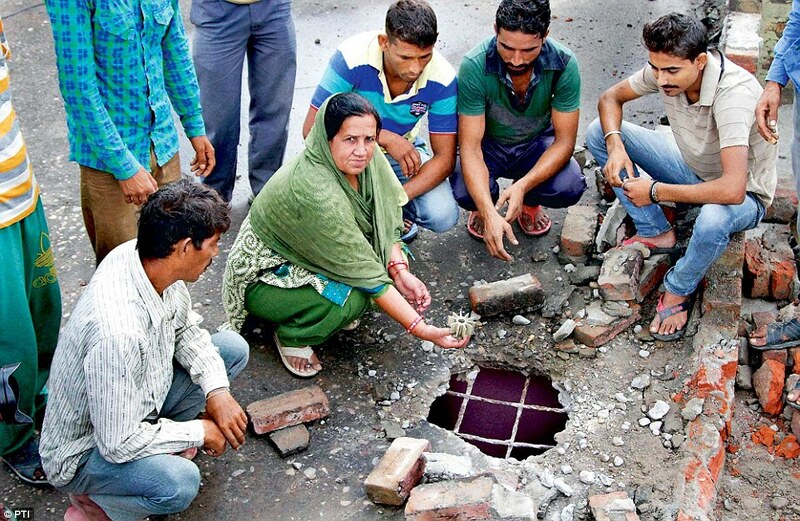 A woman displays a mortar shell fired by Pakistani troops that damaged the roof of her house at Arnia in Jammu. The government is not prepared to hold any discussion with Pakistan until the firing stops, as it wants to underline the point that Islamabad cannot dictate the terms of dialogue. The border move is no flash in the pan; it comes after a series of deft diplomatic moves. A top government functionary said a series of steps were taken in recent weeks to block every attempt by Pakistan to internationalise the Kashmir issue. To begin with, the UN Military Observer Group (UNMOGIP) was made irrelevant. Prime Minister Narendra Modi’s address to the UN General Assembly in New York ensured that Kashmir was not allowed to dominate the agenda. Coupled with some diplomatic engagements with Japan and China, the moves ensured that the Kashmir issue became irrelevant. Calling off the foreign secretary level dialogue with Pakistan because of its continued parleys with Hurriyat leaders also played a part in frustrating Pakistan. Prime Minister Narendra Modi, who is busy touring Haryana and Maharashtra where Assembly elections are due, has remained in close touch with the service chiefs to get the updates on the situation on the border. Sources said New Delhi is prepared for a long haul and will not stop at massive retaliation until its objective of keeping the sanctity of the ceasefire is met. 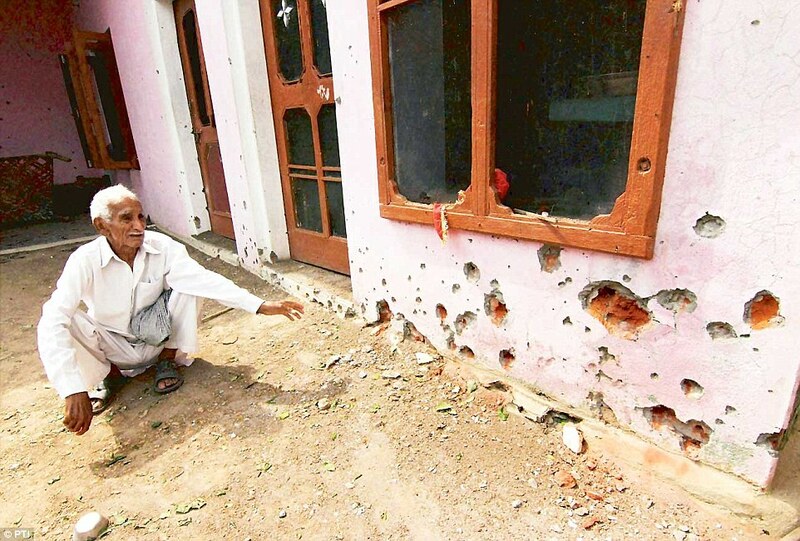 A resident of Chilayari village in Jammu shows the damage inflicted on his house by Pakistani shelling. Firing along the Line of Control would not have attracted international attention, and sources ascribed this as the reason for why the International Border was chosen for a series of ceasefire violations. But it hasn’t worked, and there is no pressure on India to scale down firing, said sources. India does not want to give any space to Pakistan that can dilute or weaken New Delhi’s basic condition of ‘no dialogue in the shadow of gun’. By resorting to tactics like ceasefire violations, Islamabad is only making matters worse, sources said. Another reason for Pakistan’s latest border tantrum is the government’s concern that the BJP may do well in the forthcoming Assembly elections in the state and thus have a major say in a possible coalition government. Sources said there has not been major ceasefire violation along the Line of Control since Wednesday, but the International Border, particularly in the Jammu region, continues to be rocked by firing. Secretary (Border Management) Snehlata Kumar has briefed Home Secretary Anil Goswami, who also met National Security Advisor Ajit Doval. BSF chief D.K. Pathak is on the ground assessing the situation and personally supervising operations. “Pakistani troops are targeting the civilian areas because they think that they are not being able to cause any big damage to the BSF posts,” he said, adding that at present there is no talk of a flag meeting. IAF chief Arup Raha also said that firing on the border was “serious” and that the government wanted a quick resolution of the problem. The latest episode marks a considerable toughening of India’s stand on border stand-offs. Similar resistance was shown during the stand-off in eastern Ladakh’s Chumar area last month. After India refused to budge, the People’s Liberation Army (PLA) vacated its positions in the disputed territory and agreed to the pre-1 September situation. INDIAN NATIONALIST, m2monty, sunny6611 and 2 others like this. It is always blacked out wherever and whenever the situation is not favorable to Pakistan. Which is most of the time. Typical tactic of dictatorships & failed states. Zeus_@21, Anees and Gessler like this. This is why Modi is a 1,000 times better than any other PM candidate. m2monty, Sree and omya like this. marshal panda and Gessler like this. You forgot about Shastri and Indira in this regard. It is heartening to some extent to know that we are retaliating after so much time, paying them by their own medicine!! In the background lies the terror of an full scale escalation of hostilities, which could cripple the two countries quiet badly. More over we are not like Japan or Germany or for that matter the European countries to build back from scratch like what they have done post WW-II. This could also be a calculated work of other rivals who might have tried to light the tinder to enjoy the spoils. To gain their supremacy! at the same time kill the competition. Since most of these guys are fanatical and hotheaded lunatics there could be more damage and vast scale destruction. Lots of neutral analysts, watchers in the West are already vocal about support toward India, rather than Pak. what would happen after 2014 UStroops withdrawal from AF-Pak . pakistan wont get any funding and usa might be tuff on pak ... maybe thats why Pakistan is creating problems all over .just to show that they are still relevent.